Monty Python’s famous Cheese Shop. Watch it HERE. 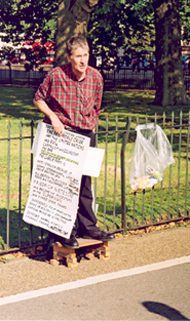 At the northeast end of Hyde Park is Speakers’ Corner where on Sunday afternoons an assortment of crazies and true believers hold forth in exercises of free speech. The British cherish these as symbols of their democracy, even as they see most of it as silly. On a recent Sunday afternoon the silliest person I saw wore a white Panama hat and the British flag as a cape. In one hand he held a wine bottle and a corkscrew with the cork still on it, in the other a smoldering cigar. Rambling on and on about Bob Marley and buffalo soldiers, he drew a crowd that heckled him with laughter and obscenities. Ten yards down the walk Tony Allen, apparently a favorite at Speakers’ Corner, stood on the bottom step of a small aluminum ladder, a chalkboard fastened to the front proclaiming him “Advocate Heckler—Anarchist Parasite—Mixed-Ability Shaman—www.newagenda.co.uk.” Just across from him a fiery socialist standing on the middle step of a wooden ladder had drawn by far the biggest crowd, though during the first moments I saw him he had gotten himself tangled in an unfortunate twist of logic, both semantic and political, trying to defend his assertion that while England was an imperialist nation, China was not. I went to school at the University of California, Berkeley, arriving in the late 60′s at the tail end of the Free Speech movement and leaving with the Cambodia crisis and the killings at Kent State. When it wasn’t thick with tear gas, its central plaza, Sproul Plaza, was always thick with speakers and pamphleteers, so Speakers’ Corner was almost too familiar, especially the earnest bombast of the socialist. Yet for all the politicos at Berkeley, I most remember two religious speakers. Parking himself at the south end of Sather Gate, the university’s main entrance, and, standing still, Holy Hubert thundered hell fire, while Isaac the Satanist, dressed in black, strode a five yard stretch back and forth at the north end discoursing more softly about his Father. Together they achieved a curious and ultimately cherished religious ying/yang, one preaching salvation from damnation, the other salvation through damnation. The religious speakers at Speakers’ Corner were not nearly so balanced. One bellowed about his personal relationship with Jesus, another proclaimed the true meaning of the Koran, both, like all the religious I saw that day, exuding a presumptuous, irritating purity that made holiness something bitter and prideful. In late September the Danes gave the European Union a thoughtful blow as it voted down adopting the EU’s proposed currency, the euro. Some think the Swedes will follow suit. I judge that at least 70% of Londoners loathe the idea of giving up the pound, and even in Germany—the euro’s greatest backer—a recent poll showed 66% saying they’d just as soon keep the deutschmark. Few people express enthusiasm for the currency, but there’s a lot of campaigning for it coming from somewhere. In France there are posters showing the proposed euro currency and the caption, “Your Future. Our Future.” Many receipts now give the price in francs and what it would be in euros. An October 28th receipt of mine carries the information that “1 EUR = 6,55957 FRF,” so that my bill of 179,00 francs would be just 27,29 euros. Still, the feeling is that most everyone would be in favor of keeping to their own, and not just regarding currency. On an early October Sunday I and some of my students joined a group called Philosophy For All for a hike around the Boxhill region in the village of Westhumble, just outside the southwest border of London—London’s “Lover’s Lane,” I was told. A largely liberal group, many of its members expressed initial enthusiasm for the European Union, an enthusiasm which waned considerably when it got down to specifics. Cheese, for example. The European Union will call for more uniform standards imposed across a wide variety of areas—law, currency, pension funding, etc. “The French probably think their cheese is the best in the universe, so don’t tell me they won’t try to impose their standards on our cheeses,” said a fellow hiker as we stepped through the classically lovely English countryside. I had just mentioned that Monty Python’s “The Cheese Shop” was one of my favorite pieces of comedy, the joke being that a man goes into a cheese shop desperate for cheese only to discover slowly, torturously, that the shop has no cheese whatever (see link above). It is a minor goal in my life to taste each one of the 50 or so cheeses he reels off in an attempt to purchase any morsel he can, and I had just had my 27th of the 50, a piece of Red Leicester I got at Vincent House. “But we want to keep our cheese just as it is now,” our fellow hiker said. “It’s pretty good if you ask me, and we want to sell it to our own people in our own way and for the price we want to sell it for.” So add cheese to the many, many things the European Union may be stumbling—or choking—on. Go to lead post in this series and see end for a complete list of series items. This entry was posted in Diversity & Multiculturalism and tagged Euro, European Union, Holy Hubert, Isaac the Satanist, London, London-Hyde Park, Monty Python's The Cheese Shop, Nationalism, Remembering London, Speakers Corner, Speakers Corner-Hyde Park, University of California at Berkeley. Bookmark the permalink.